Miroslaw Ignacy Wojciechowski was born on 6th March 1917, in the small village of Zoppot on the shores of the Baltic Sea. 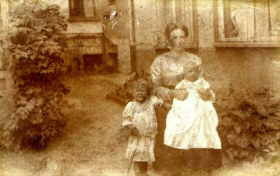 The family had houses here, in Warsaw and in Torun. He was one of five children born to Ignacy Wojciechowski and Wanda Gertruda Wojciechowska (nee Behrendt), having three older sisters - Halla, Janka and Marisia and a younger brother, Roman. The house on Annenstrasse, Zoppot (now Ceynowy Floriana, taken 2006) The house where Mirek was born, 2 Annenstrasse, Zoppot is still there. Of course, whilst the house number remains the same, the street (as were all streets in all "German" towns in Poland after the war) has been renamed - Ceynowy Floriana - after a famous 19th century Kashubian and Polish nationalist. The town now has a Polish spelling - Sopot. Whilst in 1917 Poland was becoming an independent country, having already effectively driven two of the three partitioning empires from its borders (Austro-Hungary and Prussia), war still continued on the Eastern front. Poland's citizenry would suffer almost as heavily in the First World War as they would in the Second. Even at the end of the war, Poland would not be at peace until the invading Soviet Red Army was defeated almost at the gates of Warsaw; Mirek's father fought on horseback with the Polish cavalry at the battle of Zamosc where Lenin's armies (led by Stalin) were driven back. Poland's new Statehood and her new borders would clearly owe much to her own efforts. Swathes of land to the east, not Polish speaking by any means, and including the historical capital Lwow of the old Polish-Lithuanian empire, would be appropriated to the new country. Lands to the west, with a minority of German speaking inhabitants, would be left to Germany or carved into the Danzig Corridor and the Free State of Danzig, an area now covered by Gdynia and the more famous Gdansk. Zoppot fell within the Frei Stadt Danzig. When, in 1932, the family needed a copy of Mirek's register of birth, it would be in German. It identifies his father as an "im felde abwesenden Gutsbesitzers" - literally an "in the field absentee landlord". It gives the families religion as "katholischer". 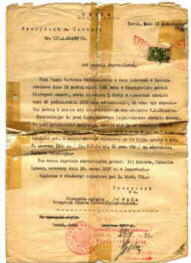 As this was a legal document, it also gives the name of the midwife who attended the birth; Klara Schlagowska (nee Richert). 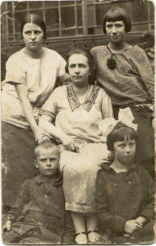 Janka, Halla, Mirek and Marisia with their mother, Torun 1925 Mirek grew up in Torun. 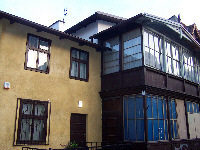 After his father's death in 1926, the family did not often go to Warsaw. Although plans had been made for him to go away to school, his mother decided to keep the family close by and he attended a local school. By 1930, he had decided he wanted to join the Polish Air Force. This was much against his uncles' wishes, for they were cavalrymen like his father. However, his mother allowed it. 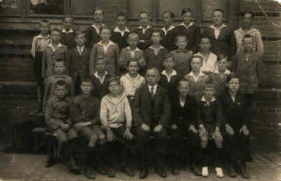 Mirek completed his school education in 1933. 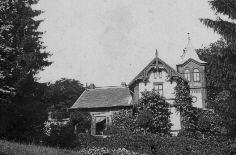 He gained satisfactory or very good marks in most subjects. Despite being fluent in German, he was graded only satisfactory. In keeping with Polish bureaucratic tradition, his birth date is again given incorrectly at 6th March 1918. As an interesting footnote, he was examined in Geography with particular reference to his knowledge of modern Poland. In addition, he would not be able to enter the Air Force Academy without proof of his Polish citizenship. Poland was a new country, younger even than he was; his mother obtained the necessary copy of the entry in the register of births from Zoppot and then took the oath of citizenship for herself and for her son in 1932. 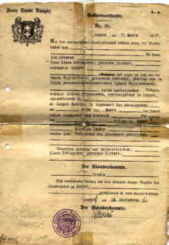 Wanda Gertruda Wojciechowska's "Sworn Affidavit of Citizenship, 1932 The "Sworn Affidavit of Citizenship" was a common document; in it, Mirek's mother renounced claims to any other state and by laws enacted for this specific purpose in 1920, claimed and was given Polish citizenship.